Attractions across Atlanta are offering Holiday Events perfect for kids (and adults) of all ages. We have put together a list of events with our Discounted Attraction Partners. Ask your concierge for more details about discounted tickets and information! Each day of Stone Mountain Christmas, you can enjoy some of your favorite park attractions like Summit Skyride, Scenic Railroad, and more! Then, immerse yourself in holiday magic with evenings full of festive music, millions of dazzling lights, spectacular shows, and visits from some of your favorite holiday characters! New for 2018, engage your senses at The Polar Express™ 4-D Experience and marvel at the Enchanted Tree Lighting Ceremony each night before our famous Christmas Parade! Start a new family tradition this season and create memories that will last a lifetime for your kids…and for you. Holiday in the Park — named One of the Best Christmas Events in Georgia — is back for the 5th year in a row on select days from November 17-January 6 at Six Flags Over Georgia. It’s the most magical time of the year filled with enchanting experiences that will help create those special family fun outings again and again. Our breathtaking winter wonderland features a variety of delightful and interactive activities to help capture the holiday spirit. Snow Mountain is Atlanta’s favorite winter destination with a 400-foot snow-covered tubing hill and an enormous snowy play area. Race each other down the slopes on Tube Runners or brave the hill together in family-sized tubes on Avalanche Alley. It’s all about the cold stuff in the SnowZone—a winter wonderland full of real snow where you’ll find Penguin Run and Little Angels—the perfect spots for small ones just starting to find their snow legs. Bring the whole family to be part of the second-annual lighting of the Zoo Atlanta holiday tree. Zhu Zhu the giant panda mascot flips the switch at 5:30 p.m. in Flamingo Plaza! Be here when Santa makes his first stop – Zoo Atlanta! Bring the little ones for a personal visit with Santa and a professional photo. Warm up with hot chocolate and cookies, and start the holiday season with festive crafts, costume characters, animal encounters, music and a holiday movie. And of course, you’ll go home with a bag of reindeer chow for when Santa and his helpers make their visit to your home! Start a holiday tradition by enjoying Breakfast with Santa and whale sharks, manta rays and Tank the sea turtle! Enjoy a gourmet breakfast buffet provided by our fantastic chefs at Wolfgang Puck Catering, write a letter to Santa and hand-deliver it, enjoy a holiday craft and spend some quality time with jolly ol’ St. Nick. Bring your camera so you can take a photo with him! You’re invited to ring in the New Year at downtown Atlanta’s most exciting New Year’s Eve party: Georgia Aquarium’s Black and White New Year’s Celebration! You can feel good about attending, because this special event is a fundraiser for our vital research and conservation programs. Join us as we toast to 2019 amongst whale sharks, sea otters, jellies, hundreds of fish and of course, our black and white tuxedoed hosts, the endangered African penguins! Suggested dress is black and white cocktail attire. 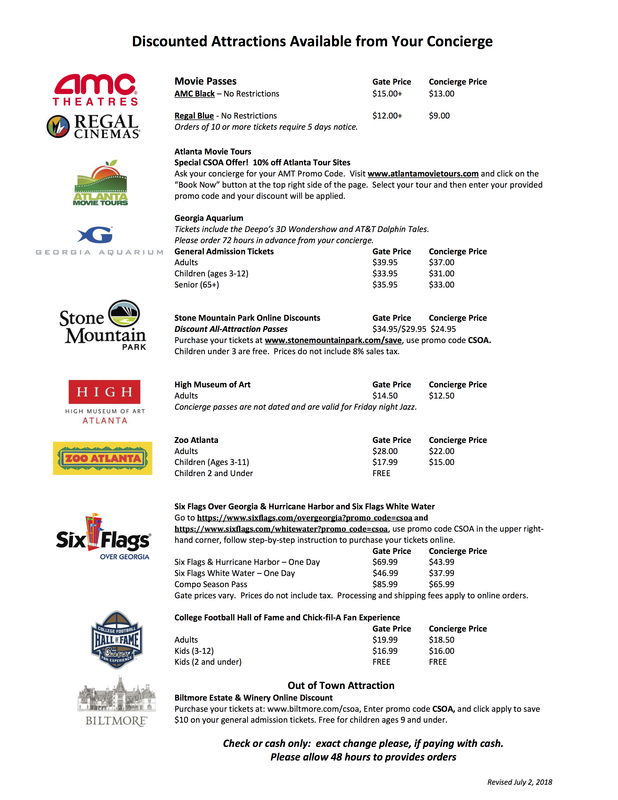 Concierge Services of Atlanta gives you access to discounted movie passes and local area attraction tickets everyday. We have relationships with cinemas as well as museums, theme parks and other Atlanta area attractions that enables us to purchase consignment tickets in bulk, for discounted prices. We, in turn, pass these savings along to the residents in our residential properties, the tenants in our corporate and retail properties and our ticket club members. Tickets can be purchased through the Concierge or online with the use of a special promotional code. Please see your Concierge for details. Read More.